Standpoint Education provides art education activities for young people. Standpoint sees art and education as inextricably linked, and are committed to providing high quality, flexible educational programmes to meet the demands of a culturally diverse community. Our targeted workshops have involved painting, drawing, sculpture, collage, printmaking, photography, film, animation, conservation and ceramics. Standpoint works with local schools and colleges, youth clubs, special needs and community groups, and the general public. In addition, we provide work experience through gallery internships and Trident and other work placement programmes. 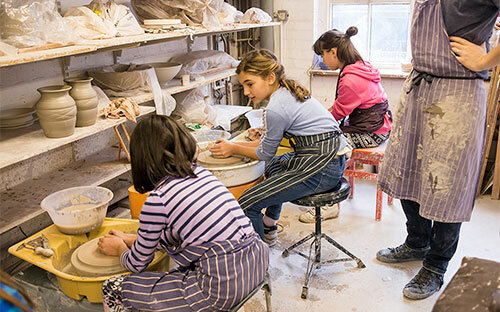 Through craft activities, one day workshops and extended courses, we provide an opportuntiy for young people to learn new skills and techniques from inspiring artists and to visit a professional run artist studio. Places are subject to availability. If you have a group that you think would be interested in a workshop or talk with our exhibiting artists, residency artist, or studio artists, please email us.